We house about 200 residents in single study-bedrooms, with shared bathroom, common living and kitchenette facilities. There are also study rooms, outdoor courtyards and a large dining hall for you to use and enjoy. 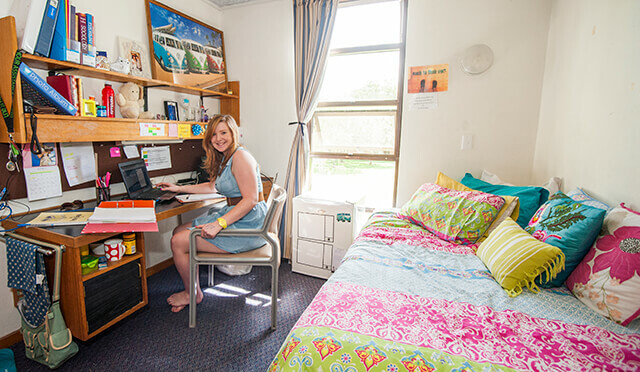 We have great facilities — for relaxing, studying, living and more! The courtyard: One of the best things about our college. It's huge, it's green and it is the place to be. Throughout the year many functions, activities and games are held in the courtyard. 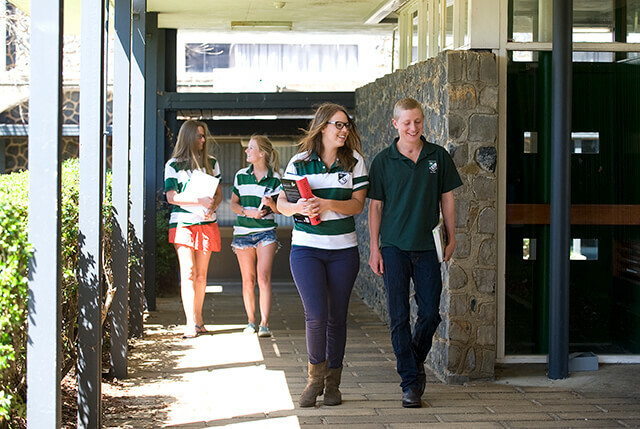 Students study in the courtyard, play volleyball, badminton, soccer, backyard cricket. It is the biggest college courtyard at UNE — and we enjoy every centimetre of it. Common rooms: Every floor has its own Common Room, fitted with a flat screen TV, lounges and tables. This is a great place to relax with friends, watch your favourite movie or TV show, or study with a few mates. Guy Ballard Room: Our main entertainment room can host a variety of functions with its wide screen TV, lounges, pool table, dart board, and table tennis. Gym: We have a gym, ready for a quick workout between classes. This really helps with getting that perfect life balance! Bike shed: The College has a secure bike shed available to residents. BBQ areas: These undercover areas are perfect for a birthday or a floor party. Computer room: If your computer has broken down in the middle of an assignment or you don't have your own printer, access to this room is a bonus. This is also a great place for a group study session. The scanner, printer and photocopier are available here 24 hours! Music Room: Just because you move to college doesn't mean that you have to give up your favourite instrument. You'll also need to practice for all of the inter-college events like small music ensemble and performance. The music room has padded walls, drum kit, piano and keyboard. There is also a grand piano in the dining hall. Bathrooms: Every floor has shared bathrooms with really big showers and plenty of hot water. Shared kitchenettes: With a fridge, a sink, a microwave and a kettle — perfect for when you need some late night noodles to get you through that assignment! Laundry: Washing machines are FREE! There are also drying rooms, dryers, ironing boards and irons. Parking: There are hundreds of car parks around the colleges. You will need to purchase a parking sticker to park in the College bays. This same sticker allows you to park in bays across the university. Rooms are initially allocated by the Head of College but preferences and room change requests will be accommodated as much as possible and in consultation with the Junior Common Room Committee and Resident Tutor team. Your room is centrally heated and includes a bed, broadband internet access, desk, cupboard, mirror and shelving. Furnishings in rooms, as well as common rooms or work rooms, must not be moved. The resident will be charged for any damage to the room, furniture or fittings. You are welcome to make your room feel as much like home as possible so feel free to bring posters, photos, fairy lights or your pet fish! A number of Resident Tutors in each accommodation block oversee the day-to-day functioning of your accommodation and are the first line of response in managing any issues you may have. Being the first college at the Southern entrance to UNE, off Queen Elizabeth Drive, we are easy to find and sit amidst a grove of wonderful Australian Gums. Common rooms and study rooms are well furnished with the dining hall, Learning Centre and Music Room offering a quiet alternative to the college living space. The next phase of UNE’s Old Robb College redevelopment is underway, following the appointment of architects to develop plans for the college’s new residential courts. After a competitive tender process, Billard Leece Partnership (BLP) has been awarded the contract to design Robb’s new residential courts for 21st Century usage while honouring the appearance and practicality of the college’s original 1960s architecture. BLP will also design a new 270-bed residential building on UNE’s Bellevue campus. The firm has an extensive portfolio of education projects. UNE Vice-Chancellor, Professor Annabelle Duncan, said she is delighted with the current progress of the Robb redevelopment after a decade-long stall in the process. “We have come into 2018 at last having the capability to redevelop Robb College so that it has a future as strong and compelling as its past,” Professor Duncan said. Prof. Duncan congratulated BLP on winning the Robb College contract. The Robb College meal package offers 10 meals per week — 5 lunches and 5 dinners — from Sunday to Friday. The meal package is compulsory and costs $77.00 per week. Residents also have access to a communal kitchen to prepare main meals outside of the catering provided. 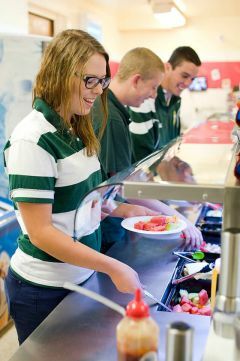 Formal, semi-formal or buffet diners are held regularly and are important functions on the College calendar. They often include events such as guest speakers, debates or competitions. 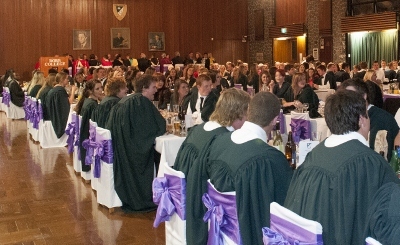 These dinners are the only formal occasions when the whole College meets together and students are expected to attend. When formal dinners and buffets occur, the meal times may vary.